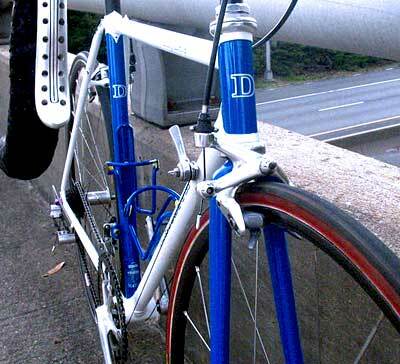 Resurrected from the dregs of someone’s basement, is this early 90s Davidson Impulse – that’s just one of the frame models that gave Bill his frame-building cred and he’s been at it for 38 years. Bike trivia: “Davidson Impulse” can be re-arranged to “Damn Livid Spouse!” and Impulses are still trading today amongst collectors, on eBay, and that’s damn lucky to find one in a basement. Check this Bicycling magazine review of Custom Bicycles for Specific Needs, written by Gary Fisher, in March 1978. Sadiq Gill built the frame up with older Mavic SSC stuff, Phil Tubular wheels, and wrote that she “rides fantastic” … tripping the bike fantastic.